When the Museum opened in 1989, volunteers were key to its launch and early years. The impact from the efforts of the volunteers has grown and evolved, benefiting the Museum in countless ways. For many volunteers, the growth is also personal, as interests turn into an expertise and a passion. Involvement with the Museum has built additional purpose in the lives of many. A very good example of this personal development and project passion is the committed volunteers with the Veterans History Project. 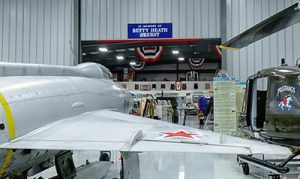 Shortly after the museum opened, a veteran named Joe Oberst offered not only the idea of the Warhawk’s involvement with the Veterans History Project (VHP), but he also backed it up with substantial funding in order to make it happen. The Library of Congress oversees the VHP, and has forms and guidelines that must be followed by participants. A WWII Army pilot, Oberst’s generosity and fundraising resulted in $100,000 in funding for the Warhawk, allowing the Museum to become a VHP partner. This funded a sound-proof room for interviewing and filming, a camera, microphone, lighting, and the computer set-up for editing. The Museum wing that houses the set up is named for Joe’s wife, Betty Oberst. From the very beginning, volunteer Carmelita Pope joined the effort, and brought her acting background to the benefit of the project. Pope contributed her time and expertise with lighting and interview techniques. She scheduled and facilitated veterans willing to tell their story. She and Sue Paul have partnered on countless interviews. 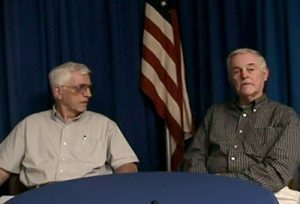 Other volunteers who have been instrumental in the initial VHP involvement, and continue to this day, include Stan Hobson, a Korean War veteran (Navy) and Barry Hill and his wife Ali Hill. Each has experienced many gratifying and sometimes surprising interviews along the way. Starting with a willingness to learn the process, they have each evolved in their abilities and expertise, and have been key contributors in a level of project success none could have predicted. 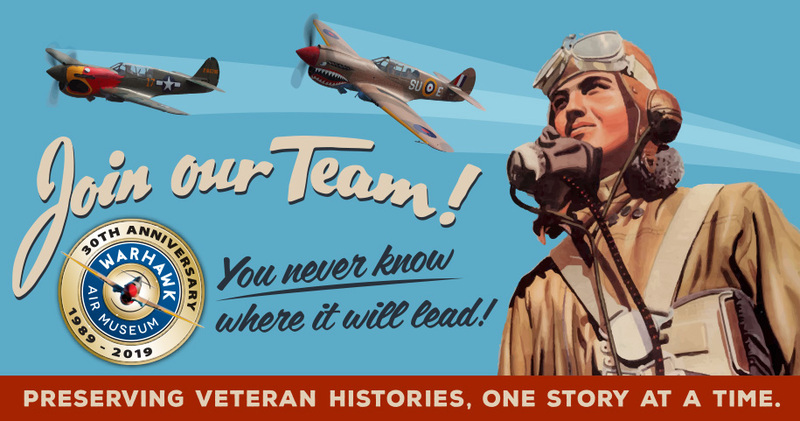 Why is the Veterans History Project so valuable, both at the Warhawk and, more broadly, at the Library of Congress? Quite simply, stories are being told by Veterans, and these stories are preserved. Participating veterans come from conflicts ranging from WWII to recent history, such as the Gulf War and the Middle East Conflict, and give first-hand accounts that would be lost forever without these recordings. This is especially important as fewer of our country’s WWII Veterans are among us, with a very finite number of recording-opportunity years remaining. One of the most powerful aspects of these interviews is the fact that for some veterans, their interview is the first time they have re-counted some of the details of their experiences. The interview process can then become quite cathartic for the veteran and the Warhawk volunteers conducting the interviews report how rewarding the process is for them as well. Barry and Ali Hill sitting in front of “Blood Brother” during the 2017 Warbird Roundup. Ali Hill has run camera for many Sue Paul-led interviews. She also tends to the details of a four-page form required by the Library of Congress. 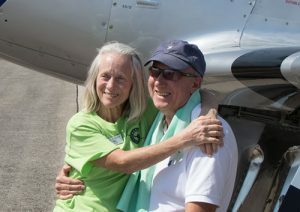 Her husband Barry Hill has also been an active volunteer on the project, and holds many interviews in his memory that were truly unforgettable. He has been involved in countless interviews, from a host of wartime experiences. “Our interviews are war-related and also war-industry-related—think Rosie the Riveter. We have interviewed Wake Island survivors, as well as Japanese Americans from the settlement camps. Some will agree to the interview, and think their experience may not be all that interesting, but that always changes through the course of the interview. There have been some surprises, and some very, very important and powerful stories told, that would otherwise have been lost forever,” says Hill. One example Hill recalls easily is with Darwin Dodds, a Prisoner of War on Wake Island. Morrison-Knudsen Company, headquarted in Boise, Idaho, had a construction project on Wake Island during WWII, and the island was overtaken by Japanese soldiers, resulting in civilians taken as P.O.W.s. These men were untrained soldiers and recounted the harshest of wartime experiences. Dodds was relieved of some of these experiences as the enemy put to use his distinctive baritone radio voice. Dodds later went on to a successful career in radio. 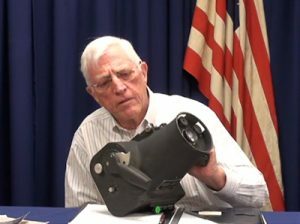 Stan Hobson during his VHP interview with Sue Paul describing a camera he used as a Navy photographer. Stan Hobson, VHP volunteer and Korean War veteran, was a photographer in the Navy. Stuart Hobson, his son, is the one credited with getting Stan involved with the Museum’s Veterans History Project. Stu, a member of the Nampa Police Department, is a Student Resource Officer at Ridgevue High School in Nampa. Ridgevue High has a special connection to the Warhawk Air Museum, including adopting the “Warhawks” as their school mascot. Stu is also part of the Honor Guard, with an expertise in U.S. Military history and the American Flag, and regularly shares his knowledge, including educating the high school students. Stan took the suggestion by his son Stu to get involved, and the rest is history—lots of it, as in over 100 VHP interviews led by Stan. Stan himself was interviewed by Sue Paul, relaying his experiences in the Korean War as a Navy photographer, which included 32 months at sea. Stan encouraged his neighbor, Robert R. “Bob” Haga, WWII, Navy, to be interviewed upon learning Bob had been in Normandy on D-Day, the largest seaborne invasion in history. The interview was so compelling, the story was picked up by the Public Broadcasting System. A snowball effect resulted in an invitation to Bob Haga to the French Embassy for a special event in honor of D-Day. Stan Hobson interviewing Bob Haga for the VHP. Bob Haga accepted the invitation for the all-expenses-paid trip, and took Stan as his guest. The unforgettable trip included a trip in a submarine, where sonar was used to locate wreckage, and a visit to the U.S. Naval Memorial at Utah Beach. On a memorial sculpture there, with the D-Day vessels listed, there was “USS Hobson”, Stan Hobson relayed. Bob Haga had been part of a flotilla of 10 mine sweepers, and recalled the nearby sister ship that hit a mine on that June 6th, 1944 day. Bob found both vessels listed on the memorial. Theirs was an unforgettable trip, full of emotion and exciting adventure, across the globe in France, decades past Bob’s tour of duty. And it all started with stories told, first between neighbors across the street from one another, and then in the recording studio at the Warhawk. From there, picked up for national broadcast, and then recognized for inclusion in an anniversary event on the shores of Normandy. You never know where volunteering can lead you—in Stan’s case, France! Stan Hobson has found his volunteer work with the VHP to be incredibly enriching. He shares this passion with his wife Kathryn Hobson, who has operated the camera when they have interviewed veterans while traveling. While the sound-proof studio at the Warhawk is the ideal interview environment, Stan and Kathryn have taken it on the road more than once, from interviews at the State Veteran Home in Boise, to residents of an assisted living facility in Burley, Idaho, and even out of state while visiting relatives. 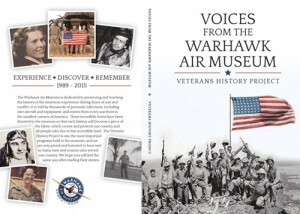 Stan and other VHP interviewers are proud of a publication, available at the Museum, titled “Voices from the Warhawk Air Museum, Veterans History Project”, published in 2015. It features 60 of the interviews. Stan also highly values the benefit these interviews bring to families. Through a veteran’s interview at the Museum, memories and details are forever captured, and often become a cherished keepsake and learning tool for family members—especially younger generations. A more complete picture materializes through the course of the interview, drawn out in a way that is typically more comprehensive than family storytelling. “The DVD is a real gift for the grandkids,” says Hobson. Sue Paul describes how the Museum has developed an interview process, and also relayed how the Museum would love to involve more female veterans in the interview collection. Each veteran’s story is important and has value. Some of those interviewed might see their particular experience as fairly ordinary, but very often, extraordinary is the interview result—another piece in the wartime histories of our country. Some interviewed kept diaries during their service duties and have been able to provide great detail because of it. For a potential Museum volunteer looking to grow their skills, or contribute with their interests or skill set, the VHP can always put a volunteer to work in a variety of capacities. Who knows where it might lead for our next new VHP volunteer? We want you—to get started as a volunteer! The process is simple. Fill out our online application, or print and mail (or bring in person) the PDF application. Char Boyd, our volunteer coordinator, hosts a meeting on a regular basis for new volunteers. Then you come to the Museum on your own and start to identify your area of interest. If your interest is the VHP, Barry Hill hosts informative overview workshops for those interested. Expect a 1 to 1½ hour workshop presentation. Barry leads the group through the Warhawk’s VHP interview process and explains the front-end training, which includes sitting in on a few interviews. Can’t volunteer? You can also help by sending a donation to the VHP, helping ensure important history-keeping projects continue.